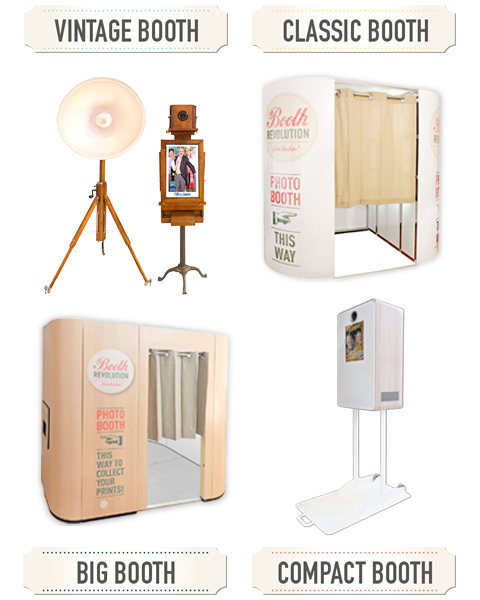 We have designed four different (but equally fabulous) deluxe photo booth models to choose from. Their stylish neutral appearance fits well into any setting, whether it's a wedding, party or corporate affair! Custom photo booths are also available. Please visit our Corporate Events page for more information about this. Our Big Booth, as the name suggests, is super roomy and can hold up to 10 people at once! Don't believe us? Then check out the movie on our home page. It even includes a sound system, making it the ultimate party photo booth! Our Classic Booth is more compact, but still holds between 4 and 5. This is our most popular model and fits into the majority of venues with ease. Our brand new Vintage Booth and Compact Booth are "open air" style photo booths with lots more themed props and backdrop options. They also allow for larger group photos and can print out as a single, 3/4 length image. This means people have the opportunity to get really dressed up and into the spirit of things! For more information about our deluxe photo booths, including sizes and venue requirements, take a look at our FAQ's. Scroll down the page for more details about our packages and how we can make your event truly amazing! Contact us HERE to get a quote! Book one of our deluxe photo booths for your wedding and receive a fantastic £200 discount off our wedding photography services. Visit www.peterleese.co.uk to view our portfolio and get in touch to find out more about this special limited offer! It's called the Wedding Package, but that doesn't mean you can't book it for a different type of event! This package is amazing value and contains everything you need for the perfect photo booth experience. You’ll save a whopping £180 when compared to booking the individual options with our Party Package! Our super friendly and professional attendants will be on hand to take care of everything from explaining how the booth operates, assisting with props and pose ideas and getting every last party goer in on the fun. They will also take care of assembling the guest book if you have selected this option with your booking. We will arrive at your venue with a suitcase packed full of stylish props. You won’t find any tacky items inside either! 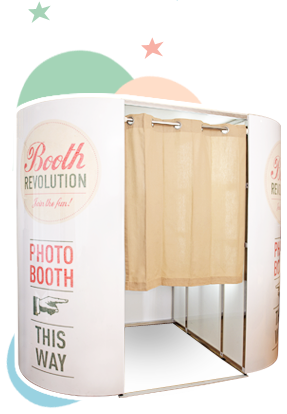 Many of our props have been lovingly hand crafted and sourced from the USA, where the photo booth trend first originated. We carry an eclectic range of weird and wonderful accessories including hats, glasses, masks, moustaches and lips on sticks, quirky signs, speech bubbles and general silliness! Want to be a cowboy? We’ve got you covered and if you have a particular theme for your event we can sort that too. One of the things we love to do is create beautiful custom designed, handmade backdrops and decorations for inside our photo booths. Let us know your colour scheme or theme and we will design you something truly unique that will make your photos pop and look truly awesome! Alternatively choose form of our range of readymade stylish backdrops or transport your guests somewhere exotic with our fun green screen option. The possibilities are endless! We have sourced the most gorgeous guestbook. Handmade in England, this recycled cream leather album contains 60 ivory pages with glycine interleaving. Measuring 31 cm x 24.5 cm, it will comfortably hold two 6 x 4" photos on a page with space for your guests to write messages and is a fantastic way to cherish and share the memories from your event. So how does it work? We set up the photo booth to print 2 copies of each print, 1 for your guests and 1 for your guest book. We assemble the book for you there and then and encourage your guests to leave comments beside their photos. We always ensure your book is completed to a high standard and will hand deliver it to you at the end of your photo booth hire, gift wrapped and in perfect condition. (Available from September 2012). Your guests can use the booth as many times as they like within the hire time and take home hundreds of colour or black and white photos that print out in seconds. Each 6 x 4” print contains 4 unique poses and is instantly touch dry and water proof. They are also incredibly durable and will not fade over time. You have the option to personalise your prints with a message or company logo as well. Add a thank you to your prints and they’ll double up as wedding favours too! Your guests will be able to view all of the event photos, order reprints, or download files to make their own prints through your own personal password protected gallery. Of course, you will have the final say on everything that goes into your gallery, so no worries if you happen upon some, shall we say, regrettable poses! You have the option to have all of your event photos uploaded to our facebook fan page after your event, so that your guests can tag themselves and share the images with everyone else. It’s entirely up to you whether you would like us to do this for you, just let us know your preference at the time of booking. You will receive a disc containing your entire collection of photo booth prints, which are printable up to the 6 x 4" size that comes out of the machine. Digital copies of the individual images can be downloaded in various different sizes from your online gallery at an additional cost. Your disc will be posted out to you within 21 days of your event, along with your DVD slide show and disc of video messages if you had these options included with your package. As well as your disc of printable hi res images, you will also receive a fun DVD slide show featuring all of the individual photos from your event, cut quickly to music. Get your friends round to watch with you and relive your time in the booth pose by pose! Our photo booths are also video booths and can record video messages in HD, which we will professionally edit and burn onto DVD for you after your event. Your guests can go in on their own or in small groups and leave heartfelt, hilarious clips for you to watch back and relive the fun of your day. This is a great option to add to your package as it gets everyone in on the fun. As your images are taken inside the booth, they are automatically sent via a live feed to a screen or monitor so that your guests waiting outside can see what’s going on. It will continue adding and rotating the pictures throughout the duration of your event. As well as a traditional large screen or monitor, we can project the images in colour or black and white onto a piece of canvas. This gives the images a lovely vintage feel, perfect if that’s the theme for your event and you want to do something a bit quirky. (Contact us to fnd out if your venue is suitable). We have a range of stylish products and merchandise available to purchase during and after your photo booth hire. Want your face on a mug? Who wouldn’t? How about keyrings to hand out as wedding favours? We can do that as well. Visit our shop (available from September 2012) for more fun ways to use and display your images.